What Is a Pin Brush for Dog Grooming? There is a variety of different supplies available for dog grooming. It might seem overwhelming to try to pick out something as simple as a brush. Did you know that there are multiple kinds of brushes for dog grooming? For now, let’s take a look at pin brushes and learn more about what they are and how to use them! What is a Pin Brush? 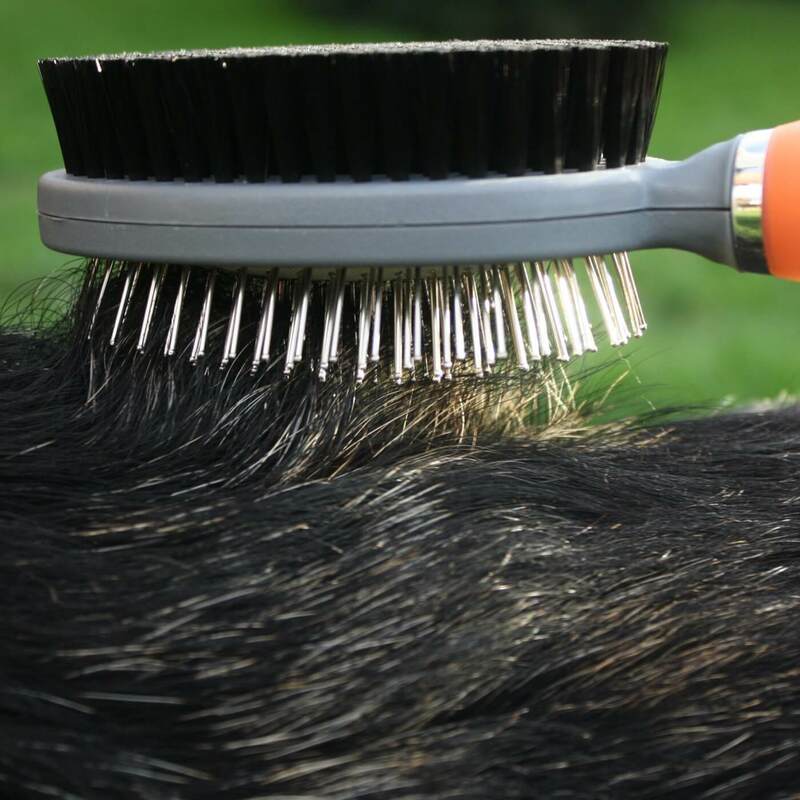 According to groomla.com, a popular dog grooming service, a pin brush is a wooden brush that has wire pins. The pins are covered by a little ball, which is either made of rubber or metal. The pins are usually spaced out more in pin brushes than other types of brushes. What Breeds Should You Use a Pin Brush On? You can also ask your local veterinarian or an employee at a pet supplies store for further guidance. This can be particularly helpful if your dog is a mixed breed or has a specific concern. Pin brushes can be used on both cats and dogs, especially long-haired breeds. You should regularly brush your dog’s fur. According to Animal Humane Society, a dog should be brushed every few days. This is true regardless of what type of fur the dog has. You may brush your dog more often when they get mats or are shedding a lot. In general, brushing will simply be a part of a regular maintenance routine. When Should You Use a Pin Brush? You should use a pin brush for regular grooming, as mentioned previously. This is just about the only reason that you should be using a pin brush because other brushes should be used for detangling mats. When Should You Avoid Using a Pin Brush? If your dog has mats and tangles, a pin brush won’t be the most effective solution. You should use a slicker brush for mattes, which can help to detangle them. A pin brush will not harm these breeds. There are other types of brushes and combs that are better suited for short-haired breeds. What Are Some Techniques for Using a Pin Brush? Pet Education has some guidelines for brushing with a pin brush. For dogs with long, flowing coats, you should brush with the coat’s grain. Dogs with rough outer coats and soft undercoats require two types of brushing. For the outer coat, you should go with the grain. For the undercoat, you should go against the grain. If your dog has a thin coat, you should go both with and against the grain. Where Can You Buy a Pin Brush for Dog Grooming? You can find a pin brush at any pet care store. You might be able to find pin brushes through online retailers like Amazon or at a general store in your area. Learn your dog’s personality. Keep this in mind when you’re choosing when to brush or groom your dog. Pay attention to your dog’s body language. If your dog tries to bite you, they are likely angry or nervous. That would be a good time to take a break. The same goes if your dog starts shaking or tries to run away. Listen to your dog. If your dog is growling, barking, or crying, it may be time for a break. Some dogs are going to growl no matter what. Find out why your dog is making noise, and find a way to gauge its meaning. Stop if you have to. It would be nice to be able to brush your dog every couple of days on a consistent basis. This is unlikely though. If your dog doesn’t want to be groomed, it’s okay to take a break or try again in a few days. Keep treats handy. Treats are a great way to encourage positive behavior while grooming. Pin brushes are useful for everyday grooming, especially in dogs (and cats) with longer coats. It’s important to use a slicker brush or another type of grooming tool for tangles and mats. You should be able to find a pin brush at any pet supply shop. Be sure to use it every couple of days to prevent tangles and mats.